Barbecue or Grilling: What’s the Difference? We often use the terms Barbecue and Grilling interchangeably but in fact they are two distinct styles of cooking outdoors. 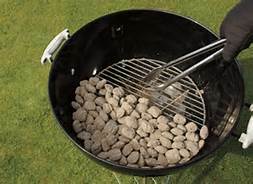 Barbecue is done using indirect heat with wood smoke either from a wood fire or wood chips. Grilling is done over a high heat source, with grilling it is important to have two zones on the grill one hot and the other cool so you can move meat that is flaring up or cooking to fast temporarily away from the heat. 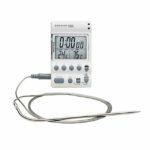 The most important tool and outdoor chef needs is a good thermometer. Cooking outdoors is influenced by many factors like temperature, wind speed, etc., to judge when meat is completely cooked by time alone. 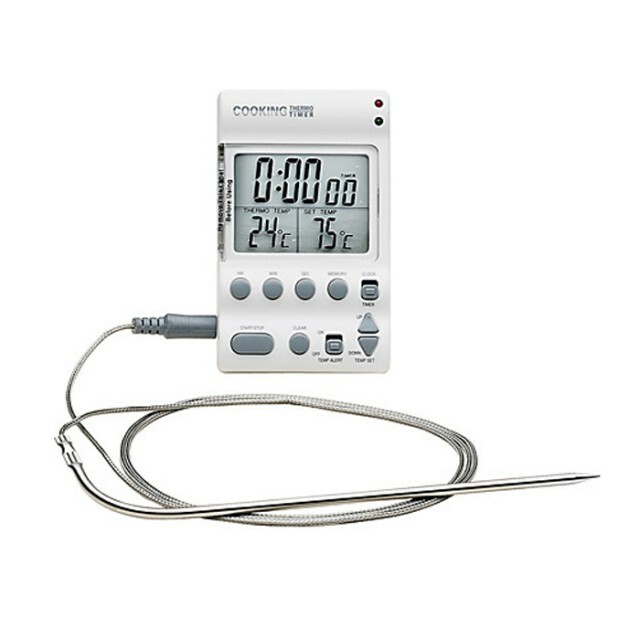 Monitor the grate temperature of the cooker with a calibrated probe thermometer. Temperatures can vary quite a bit from the grate to the exhaust, so always monitor the temperatures close to the foods you are smoking. Calibrate your thermometer. Fill a glass with ice water. Submerge the tip of the thermometer in the water. It should read 32°F (0°C). If it doesn’t, adjust it according to the manufacturer’s instructions. Make sure grill grates are clean so food won’t stick. For a quick clean up heat up your cooker, then take a number of moistened folded up paper towels in some tongs and scrub the vents. The water will quickly turn to steam adding a bit of steam cleaning power to your efforts. For dirtier grates use a wad of aluminum foil and scrub the grates, never use a wire brush. Never use chemical based fire starter like lighter fluid, use a charcoal chimney instead. Place the chimney on top of your grill grate. Crumple two sheets of newspaper into the bottom of the chimney. Add charcoal to the top of the chimney. Light the newspaper in three or four spots. Five to ten minutes later, the charcoal should be lit and ready to use. If you use wood or charcoal to cook it is very important to manage your fire correctly. To begin open all vents on your cooker until the fire is well established. Once the fire is burning well start dampening down bottom vents, the top vent should always be open to allow the fire to draw air and burn clean. You know you have a clean fire when the exhaust is a thin blue line of smoke. White smoke means you are not ready to cook, black smoke means your cooker is not clean and grime is burning off the inside walls or grates –or even worse your food is on fire. Without active combustion, creosote forms. This thick, oily substance produces a bitter flavor and dark, burnt-looking meats and tasting meats. For moist flavourful moist poultry or pork try a brine To make a simple brine add about 2 tablespoons of table salt per liter of water/liquid. Brine meat in the brine one hour to overnight (for larger pieces of meat), remove, rinse, and dry before grilling. If you really want to have that perfect steak, chicken breast, or pork chop off the grill try a technique called Reverse Searing. Contrary to what Grampa believed searing meat directly over hot coals is not the best way to cook on a grill. Using a two zone fire slowly ‘roast’ the meat on the indirect side to about 10 degrees under your desired finished temperature then lightly coat the meat with oil and sear to finish over hot coals turning often so as not to burn. Most barbecue sauces have high sugar content and therefore will burn easily. Apply sauces only at the very end of your cook allowing the sauce to ‘set’ and brown. For a professional finished look to your meat try immersing the meat in the sauce and returning it to your cooker to set rather than brushing it on the immersion will give you a great even finish. Adding a pan of water, (or juice, wine, beer) inside your cooker will add moisture to the air that is circulating around the cooking meat. This is a very easy way to help keep meat moist. If you wish to keep meat moist during a cook you can apply a mop. To make a simply mop try mixing some or your barbecue rub with water, juice or beer. Apply a mop using a spray bottle of barbecue brush at regular intervals during your cook. Food Safety is very important when you cook outside. Proper food storage and preparation outside has its challenges. 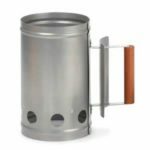 Be prepared to keep food cool and utensils and cooking surfaces clean. Please refer to Health Canada’s food safety tips for barbecuing, click here. 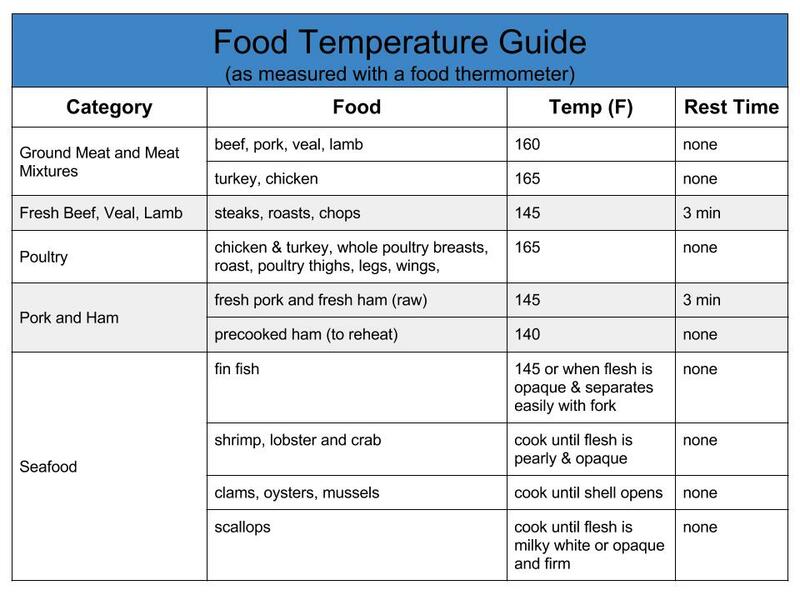 Always cook meat to the proper temperature as measured by a digital thermometer using the following as a guide. Always make sure you have enough fuel on hand for the entire cooking time and then some. Get the cooker up to temperature before you add your food. Be patient when adjusting vents to change the cooker temperature. Make small vent changes and wait 20 to 30 minutes to check the results. If the temperature is still not quite where you need it to be, make another adjustment. Temperature changes should be slow and steady, without spikes.